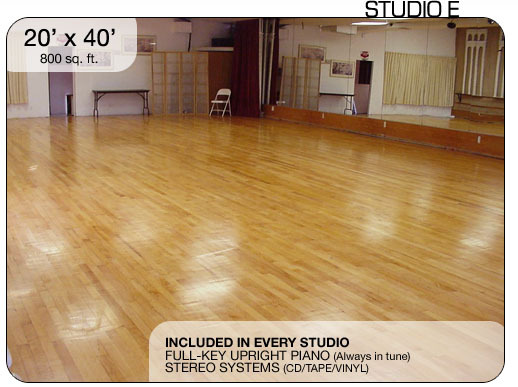 20 x 40 = 800 sq ft.
and audio playback music system via CD/Tape/Aux input via 1/8" Mini Jack. Our studios are available from 8:00 am until 11:00 pm M-F and 8:00 am until 10:00 pm on the weekends. All Times PST *Additional hours available by arrangement only. There are additional fees for filming and recording in or at the Madilyn Clark Studios. Please call or stop by our office during business hours for details.